Out of all the Chinese martial Qigong developed in the last fifteen hundred years, there are only a few styles which pay attention to the torso’s strength, especially the spine. 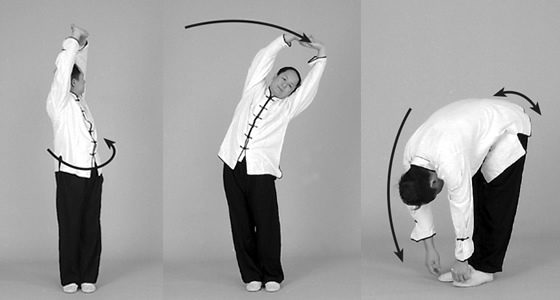 These styles are: White Crane, Snake, Dragon, and Taijiquan. The reason for this is simply that these styles are classified as either soft or soft-hard styles of martial arts in China. Out of all the Chinese martial Qigong developed in the last fifteen hundred years, there are only a few styles which pay attention to the torso's strength, especially the spine. 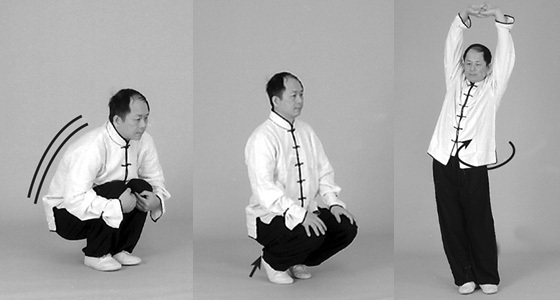 These styles are: White Crane, Snake, Dragon, and Taijiquan. The reason for this is simply that these styles are classified as either soft or soft-hard styles of martial arts in China. In order to manifest martial power softly and strongly, the condition of the spine is critical. Without the strong foundation of the torso, not only will power not be manifested forcefully, but spinal injury may also be experienced. It is because of the above reason that, since ancient times, these few styles have been recognized as the best Qigong exercises for spinal conditioning. Many Chinese physicians have since adopted these Qigong practices as a way of spinal rehabilitation for those patients with spine problems. After a few thousand years of self healing practice, Chinese martial artists became experts in treating injury and have been recognized as one of the highest authorities on many kinds of injury treatments in Chinese medical society. The common treatments are massage, herbs, and/or Qigong exercises. I recommend Qigong exercises from White Crane and Taijiquan martial arts, because these are the two styles with which I am most familiar. It is well known that the key to becoming an expert is to practice continuously, to ponder and to accumulate experience. Experience is the best teacher. As long as you remain humble, ponder and combine theory and practice, you will soon become an expert in dealing with spinal problems. If you are interested in knowing more about White Crane and Taiji Qigong, please refer to the books: The Essence of Shaolin White Crane and The Essence of Taiji Qigong, by YMAA. External Qigong is also called Dan (external elixir). Qigong emphasizes external physical movements and/or uses the mind to lead the Qi to the extremities or local areas of the body either for healing or physical strengthening. External Qigong can be classified as soft, soft-hard and hard. In the soft category, the muscles and tendons are relaxed to a deep level while moving the joints. The main purpose of this soft external Qigong is that, through repeating the movements, the ligaments are exercised and the blood circulation in the deep place of the joints is improved. Soft-hard external Qigong moves the joints softly, while twisting the joints or slightly tensing the tendons in the joint areas. 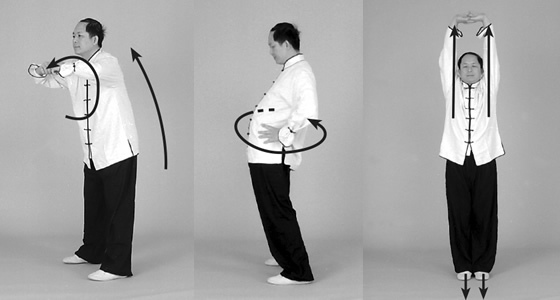 The main purpose of this Qigong is to strengthen the structure of the joints, such as ligaments and tendons. Again, through repeating the movements, the joints are conditioned gradually. Any injury in the joints can be repaired due to the enhanced Qi and blood circulation. Finally, hard external Qigong is used to build up the strength and endurance of the muscles and tendons. Normally, only the physical tension can be seen externally. This Qigong is not too much different from that practiced in the lifting of weights. The only difference is the use of the mind. In Qigong, the mind is used to lead the Qi to the muscular body first before it is tensed up. From this mind and body coordination, the efficiency and effectiveness of exercises can be enhanced to a higher level. According to past experience, in order to improve the Qi and blood circulation in the deep places of the joints, we must first loosen up the joints. After loosening up the joints, a gentle and firm stretching should follow in order to open up the joints, especially if there is any injury or pain in them. Then, correct joint movements should be done repeatedly until the joints are warm. Finally, joint loosening up exercises should be used to lead the Qi away from the joints. Before you start Qigong exercises, you should recognize an important fact. After your exercise, you may discover and experience that your back or torso muscles are more sore and painful than before. This is quite normal. There are two reasons for this. First, you are exercising muscles and tendons which you seldom exercised before. Their condition is weak. Therefore, you should start the exercises with only a few repetitions at first. Only if you feel stronger should you increase the number of repetitions. That means you are conditioning your physical body from weak to strong. Second, after you exercise, the circulation of the Qi and blood will be enhanced. This will enliven your nervous system at the local area and make it more sensitive. When this happens, you will experience soreness. You should not be discouraged by this. Treat it as a challenge. Remember, the more you move, the better your physical condition will become. However, should you feel sharp pain, burning and/or tingling or a pain which radiates down into your legs, you should again reduce the number of repetitions and consult with your doctor. Place your both arms right in front of your chest with palms facing downward. Then, turn your body from side to side gently. This will loosen up the torso muscles and excite them gradually. Repeat about six times each side. Continue to keep both your arms right in front of your chest. Loosening up your torso by moving your hips forward to generate an upward wave motion while circling both your arms up, forward and then downward continuously. The intention of this movement is to move the torso gently to loosen up the muscles. Place your hands on your waist and then circle your waist horizontally. First, circle to one side for a few times and then to the other side. If you have already experienced pain, make the circle smaller. However, if you feel comfortable without too much pain, you may increase the size of the circular motion and also the number of circles. This will loosen up the lower back area and the hip joints. Only you can decide how big the circle should be. The main goal is to loosen up any tightness in the waist area caused from back pain. When you are doing the above loosening up exercises, you should breathe naturally. Do not hold your breath. Holding your breath will make your muscles tense. After you have loosened up your waist area, you should start to stretch your torso. If you stretch your torso correctly, you can stimulate the cells into an excited state, and this will improve Qi and blood circulation. This is the key to maintaining the health of the physical body. However, when you stretch you should treat your muscles, tendons and ligaments like a rubber band. Stretch gently and gradually; if you stretch too much and too fast you will break the rubber band. For muscles, tendons and ligaments, that means the tearing off of fibers. However, if you under stretch, it will not be effective. A good stretch should feel comfortable and stimulating. First, interlock your fingers and lift your hands up over your head while imagining that you are pushing upward with your hands and pushing downward with your feet. Do not tense your muscles, because this will constrict your body and prevent you from stretching. If you do this stretch correctly, you will feel the muscles in your waist area tensing slightly because they are being pulled simultaneously from the top and the bottom. Next, use your mind to relax and stretch out a little bit more. Remember to keep your palms turned directly upward, don't allow them to roll toward the front. Also, be careful not to thrust out the lower ribs, and keep your pelvis level. After you have stretched for about ten seconds, twist your upper body to one side to twist the trunk muscles. Stay to the side for three to five seconds, turn your body to face forward and then turn to the other side. Stay there for three to five seconds. Repeat the upper body twisting three times, come back to the center, and tilt your upper body to the side and stay there for about three to five seconds, then tilt to the other side. Again repeat three times, maintaining the feeling of stretching upward throughout the entire process. Next, bend forward gently and use your pelvis to wave the hips from side to side to loosen up the lower spine. Stay there for ten seconds. Finally, if possible, squat down with your feet flat on the ground to stretch your ankles and then lift your heels up to stretch the toes. Repeat the entire process three times. After you finish, the inside of your body should feel very comfortable and warm. When you practice the above stretching, you should not hold your breath. Once you hold your breath, your body will be tenser. How far you should stretch depends on your feeling. If you feel only slight pain and discomfort, it is good. However, if you feel the pain is too much, producing physical tension and mental disturbance, then you may have pushed too far. Proceed cautiously and gently, and push a little bit farther each time. You are looking for progress, but without feeling uncomfortable pain. If you are in good health already and are looking for a more aggressive stretch to reach the ligaments, then when your arms are up above your head, keep the torso stretched while circling your waist area. Try six circulations to each side at the beginning. Remember, too much exercise may cause injury and too little will not be effective. You are the one who should make the judgment.